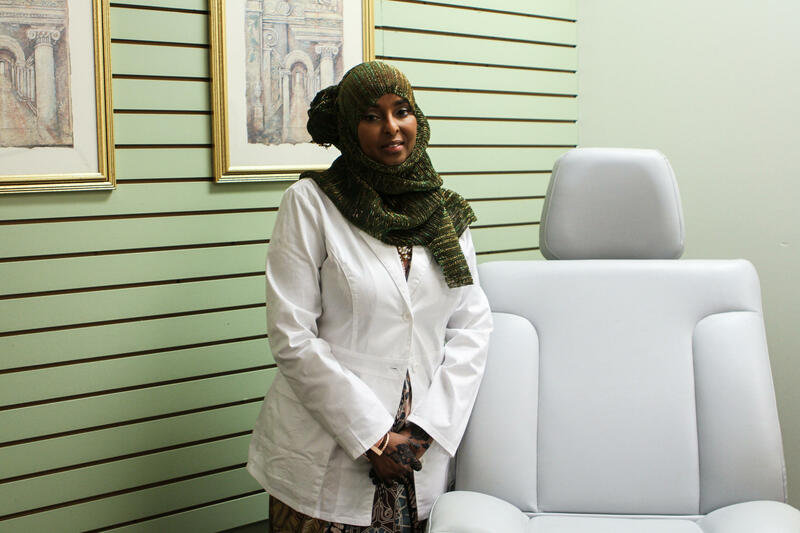 Farhiya Shirwa, left, and Amina Abdule, right, opened Ohio's first Somali primary care clinic. Columbus' Somali population is the second-largest in the country, at about 40,000 people. Research shows that the community is especially underserved when it comes to preventative testing like pap smears, vaccinations, colon cancer screening, and mammograms. Abdule says she’s seen firsthand the need for a clinic like this one—the language barrier makes it complicated for patients to explain their symptoms, get prescriptions or understand a doctor’s directions. Here, all the doctors, nurses, and pharmacists will speak Somali. Primary care services like the Medcare Clinic are generally associated with higher completion rates of preventive services. Farhiya Shirwa in an exam room in the new Somali primary care clinic. At the grand opening, attendees said that the clinic being owned by two Somali women will help women feel comfortable talking about reproductive health, and set a strong example for young Somali girls. The clinic, at 4125 West Broad Street, will officially open its doors Tuesday. And they'll welcomes everyone—Somali or not. Earlier this month, word of a measles outbreak came from the Twin Cities in Minnesota. The majority of the 64 people affected were Somali-American.